The silicon horsetail contains can benefit bone strength and could assist in preventing osteoporosis and speed healing of fractures. Selenium and silicon both help promote circulation to the scalp, and as a result, they may help prevent hair loss as an added benefit. The primary use of the herb is as a diuretic for edema and UTI and bladder infections. 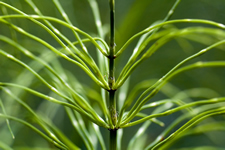 Horsetail reduces urinary tract irritation, which can lead to "leaks" and incontinence. Horsetail can be taken alone, but is often combined with other herbs to enhance and compliment the effects you are seeking. Suggestions would include Oregon Grape root, and marshmallow root for a healthy urinary system, and nettle for bone health. Bring horsetail to a boil then simmer a minimum of three hours to extract the main chemical constituents. Add teaspoon of sugar to the infusion when making horsetail tea. The sugar will pull more silicon out of the plant.